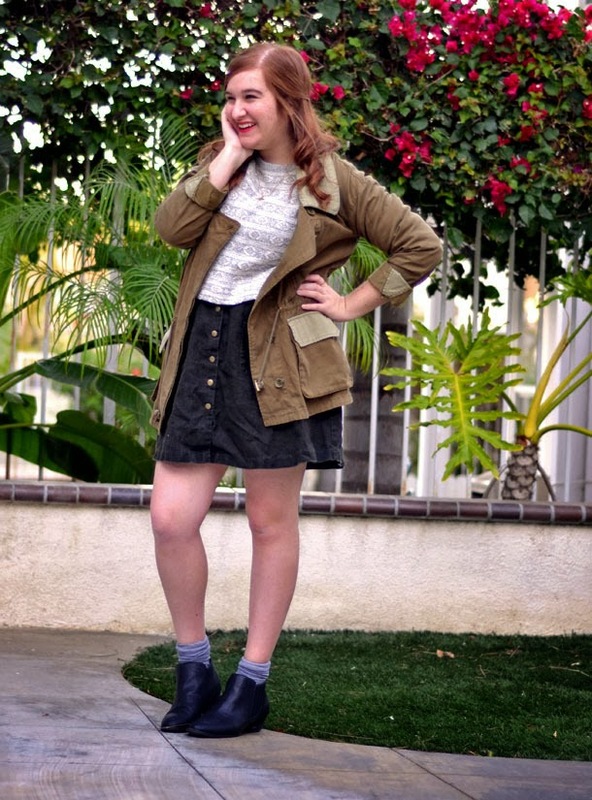 Well, apparently this is my first outfit post of 2014. I think I've told myself every day this week that I would take outfit photos, but somehow it just hasn't happened. It's really just because I'm lazy in the mornings and don't actually get in the shower until noon, and then I'm busy doing something with friends until it gets too dark to take photos. I'm pretty bummed that I haven't been able to make much time for blogging, but I guess that means that I actually have a life/friends who are willing to spend time with me, so at least that's something. As for the outfit though, something about it feels a little different for me, but I love it. I've been looking for a new utility jacket for a while now, and my good friend Alena bought this one for me as a Christmas present while we were out shopping. I love it that it's slightly more unique than most of the other ones I see due to the multiple shades of green. Plus, this cropped sweater is kind of the best. Enough about my clothes though (what is this? A fashion blog? ), I want to talk about entertainment. I've been spending most of time seeing movies, and they've dominated most of my conversations as well. Last week, I saw American Hustle and The Wolf of Wall Street, both of which I enjoyed (More so American Hustle, though). This week, however, my friends and I went to a theater a little out of the way that shows limited release movies, where I saw possibly my two favorite films of the year (since they both technically came out in 2013) — Inside Llewyn Davis and Her. I'm a big fan of the directors of each (the Coen brothers and Spike Jonze, respectively), and both were like breaths of fresh air after what felt like a lackluster year of movies. I can't stop listening to the soundtrack from Inside Llewyn Davis, and Her just blew me away. I can't recommend either of them enough. While I'm on the subject of entertainment, I should also mention the important matter of Community returning last night with Dan Harmon finally at the helm again. My life is complete again. As if there was ever a chance of me writing a short post, I suppose I should also mention Christmas and all that jazz since I haven't actually posted much since. I had a great, if uneventful, holiday with my family, and I'm sad that it's over already. My parents surprised me with a new laptop for my combined Christmas and early graduation present (it's a Lenovo, "a big girl computer," according to my mom). I'm so relieved to have a computer that doesn't freeze up on me every two minutes and one that doesn't feel like it could die at any moment. I also got that adorable fox tote on my list, some graphic novels I wanted, an adorable scarf, and plenty of Starbucks gift cards among other things. My family treats me well. New Years Eve was pretty boring, but it's never been one of my favorite holidays, so I'm okay with that. I really am hoping to blog more soon, and I'm starting to come up with some ideas that I'd like to make happen this year. In addition to outfits, I think I'm going to start having more personal posts and more entertainment-focused ones as well. I'd also like to focus a bit more on journalism, and I'm hoping to write more about some of my favorite Etsy shops and the people behind them. I already have a few in mind that I'd like to write about, but if you shop you'd like to be interviewed about, please don't hesitate to send me an email and I'll take a look! You look so adorable! That dress and sweater are perfect together! Glad to hear that you have been having such a lovely break and are enjoying your time off! Enjoy the rest of it, lady! It's a great outfit to the kick the year off! Hope you have an amazing 2014, Elana! This is a great look, love how it's a bit different for you! That sweater looks ohh so cozy, and front button skirts always make me happy. I realllly want to see all of those movies! I hope I make it while they're in the theater so I don't forget to ever see them :) Love your necklace, I am an airplane lover! The cropped trend always scared me, but this is a great way to wear it! I'm jealous of your utility jacket. I always like other people's, but when I go to look for one, I can never find a cute one that's affordable! That jacket is so awesome. I've been admiring ones like it for a while now. I think it looks so cute with your comfy sweater. Those boots are fantastic too. Also I know exactly what you mean about the sleeping until noon and hardly having time to take outfit pictures. 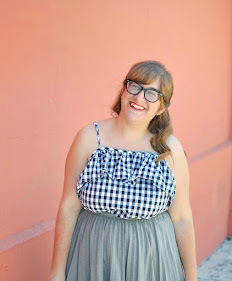 I try really hard to get dressed before the sun goes down so I have some outfit pictures in my backlog! Oooh, I've been wanting to see American Hustle! It looks really interesting (plus, J Lawrence, holla!). Haha, I'll have to look into your other recommendations. I really am loving this pretty sweater you're wearing. It's simple but has those interesting triangle designs that make it interesting. I love that you said “something about it feels a little different” because my first thought was wow, this is completely diff for Elana!! It’s the untucked sweater for sure, and it’s a tad more grunge look than usual but I absolutely completely adore this look of yours! I have a tricky time sometimes w/ looking frumpy in layers but this, this is super flatting and all around clearly I am swooning more than a healthy dose. Sounds like you’ve been having so much fun lately! I don’t think I’ve been to the movies in a yr and honsetly havent even heard of most of these movies (my no tv/grad school/work life is clearly super fun). Voting for more personal posts! Not that I don't love your style, obvi (really cute & cozy winter outfit!). But it's always nice to learn more about the person behind the blog you follow! Also, I always enjoy your entertainment bits! I am still waaayyy behind on watching the Oscar nominees this year. I've heard rave reviews about Her though, so maybe that's at the top of my list!